5 second hang on each of the pockets. I used three fingers, Austin used two. 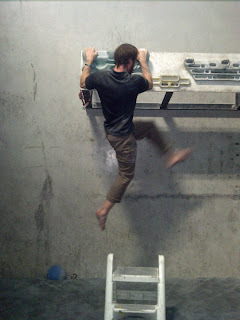 Wall stands? Basically you do plank with feet against wall, then wheelbarrow backward while walking your feet up the wall. I did 3, Austin did 5. They hurt my wrists a bit. It was a pretty good workout and it definitely drained me! Here's to crushing in Hueco!